BETWEEN THE BURIED AND ME premiere music video for “The Coma Machine”. Watch the video and pre-order “Coma Ecliptic” now here! 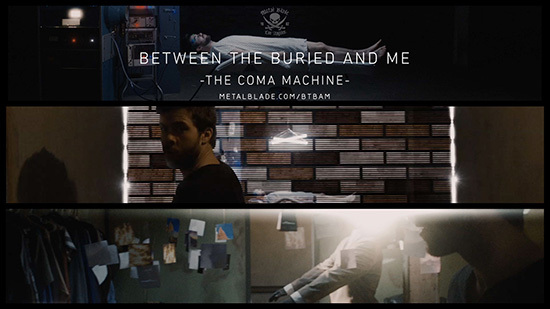 Progressive metal band BETWEEN THE BURIED AND ME have premiered a music video for “The Coma Machine” today! “The Coma Machine” is the second single off of the band’s upcoming, highly anticipated album, “Coma Ecliptic”! Fans can watch the video now here: metalblade.com/btbam! “Coma Ecliptic” is available for pre-order with special bundles and packages offered, including: CD, LP, exclusive t-shirts, an exclusive hour long behind the scenes making-of DVD. Fans can listen to the first single, “Memory Palace,” as well as pre-order the upcoming album by heading to metalblade.com/btbam. The band has also confirmed a full European headline tour for the fall! The tour will kick off in Southampton in the UK on the 22nd of September and will bring the band to ten countries in total. Support comes from Haken. “Coma Ecliptic” was recorded in January and February of 2015 with BETWEEN THE BURIED AND ME producer Jamie King at Basement Recordings in North Carolina. Drums and piano were recorded with King and Kris Hilbert at the Fidelitorium. Final mixing and mastering was placed in the capable hands of Jens Bogren (Opeth, Katatonia, Amon Amarth, Devin Townsend) at Fascination Street Studios in Sweden.